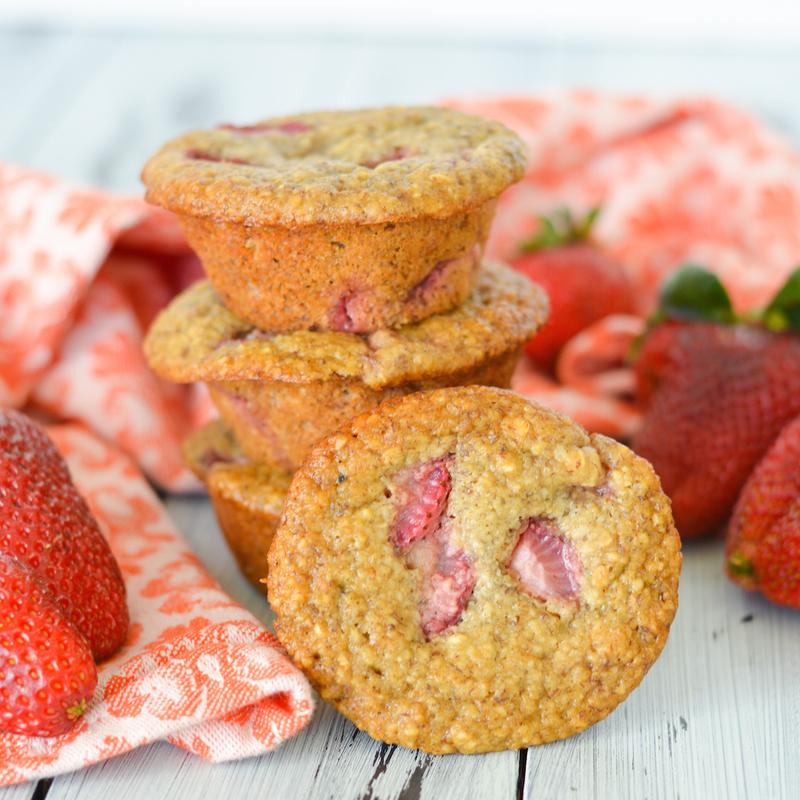 These Strawberry Banana Oatmeal Flax Muffins are flour-free, gluten-free and packed with omega-3’s. They’re delicious and perfect as a hearty, healthy breakfast or snack. My stomach is officially shrinking– errr, getting smooshed– and it’s seriously the saddest thing ever. Like when your hubby cooks the most perfect filet mignon in a pan with fresh rosemary and garlic butter and you can only eat half of it (leftovers are so not the same). Or when you go out to dinner and can only eat a few of the delicious, hot french fries you’ve been craving. But then you’re hungry an hour later, when the fries are cold and yucky. Le sigh. Since I can’t eat a lot at once these days, I pretty much spend the whole day snacking. I’ve said many times before that muffins are one of my favorite snacks! They’re such an easy grab-and-go snack and you can make them as healthy as you want. Plus, they freeze really well! Since growing babies need lots of omega-3’s and fresh fish isn’t that abundant in this desert I live in, I’ve been trying to eat a lot of chia seeds and flax seeds. They’re both great plant sources of omega-3’s. Chia seeds are easy– I love the things, put them on top of my yogurt and oatmeal, and of course make delicious Chia Seed Pudding! Flax seeds I’m not so crazy about. I tried topping my yogurt with some, but I don’t love the flavor. Luckily, I realized when you bake with flax you really can’t taste it at all. So I’ve been making lots of flax muffins! This version is made with oatmeal instead of flour, which adds some extra fiber and nutrients. Plus awesome texture. These muffins are super hearty and will definitely keep you full. Our local strawberry stands have opened up and I can’t get enough. The problem if that they sell the strawberries in HUGE baskets. And since they’re picked at peak ripeness (and peak deliciousness), they don’t last long before starting to wilt. So these muffins were also the perfect way to use up some of my bounty. But you could also use frozen berries if you don’t have fresh available. Preheat oven to 350 degrees. Spray a 12-cup muffin tin with nonstick spray and set aside. Place oatmeal in a food processor and process oatmeal into a course flour. Add baking powder, soda and flaxseed, and pulse to combine. Add the yogurt, eggs, honey, vanilla and bananas and process until everything is blended and you have a smooth batter. Remove the blade from the food processor and stir strawberries into the batter. Divide batter equally between 12 muffin cups in prepared muffin tin. Bake 18-20 minutes, until a toothpick inserted into the center of a muffin comes out clean. Cool in pan 10 minutes then gently transfer to a wire rack to finish cooling. Yum, these look delicious! I bet they would be great for a breakfast on the go! These muffins look so delicious, Jess, and I love that they’re flourless! Beautiful photos, and I’d love these for breakfast or after a workout! Thanks, Marcie! I love using oatmeal as “flour”! I love throwing flax into baked goods too- such a healthy addition. I can’t wait to see some fresh local strawberries- yum. 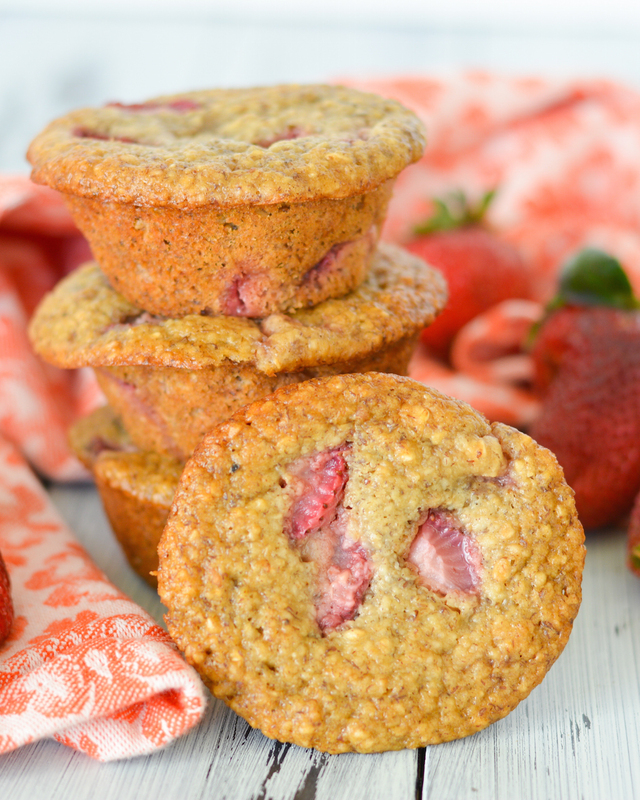 And I would have totally eaten 4 of these muffins too – they look delicious! Thanks, Sherri! Strawberry season is definitely the best!! These are a perfect snack! I’ve never thought about how a growing baby would push against your stomach and make you fuller faster- but it makes total sense! While you do have to give up on some things, you do get to snack all day long! Just made these! Do you know what the calories are per muffin? Do these freeze & reheat well. They look delicious!!!! I made these & froze them, too, and they are now a staple for me as my cholesterol numbers are inverted, so these feel indulgent while increasing my oat and flax seed intake… I even added extra flax & they are a hit at my house… trying blackberry soon! Thank you!!! Do these freeze & reheat well?